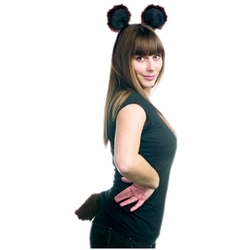 Includes brown bear ears on a flexible headband and 4" long matching clip-on tail. This set can be used to quickly and easily create a bear costume. A must have for the characters of the Three Bears in Shrek the Musical. It can be worn with a brown fur body suit or brown clothes. Hairy hands and feet plus a bear nose will help complete the look.